Since asset protection is such a hot topic today and a motivating topic for clients, many advisors are touting themselves as asset protection specialists. This is usually code for the fact that the advisor has no idea how to help clients with comprehensive asset protection planning and simply has a NV corporation company on speed dial so the client can be referred out to purchase a NV LLC (the bread and butter tool of many so called asset protection planners). The APS™ created this short series of questions for your to ask your current advisors or anyone pitching you asset protection. If your advisors or whoever is pitching you asset protection does not know the answers to the majority of these questions, they are NOT prepared to give you comprehensive advice to protect you wealth. 1) Name the types of creditors you protect your clients from. Answer: 1) the typical creditors from negligence suits (malpractice if you are a doctor, negligent driving cases, etc. ), 2) income taxes, 3) estate taxes, 4) capital gains taxes, 5) long term care expenses and the 5) stock market. Most “asset protection gurus” protect client’s assets only from negligence suits. 2) Do you allow your clients to own REAL ESTATE (usually rental property, a vacation home/condo or vacant land) in their own name? Answer: No, it is a terrible idea to have property owned individually by clients. That property is 100% at risk to all their personal creditors. 3) For a “professional,” is it good asset protection to have assets titled in the non-professional spouse’s name as a form of asset protection? Answer? No. Common and terrible advice given to professional clients (usually doctors) is to move assets into the spouse’s name to protect their property from personal negligence suits of clients (patients). If the spouse is negligent in an auto accident or other negligence suit, all of the assets in his/her name are at risk. Again, this is terrible planning. 4) Who is every client’s number one guaranteed creditor every year and what do you do to help your clients protect themselves from this creditor? Answer: The IRS. It is much more likely that a client will pay income taxes every year vs. being sued for negligence. A planner who provides complete asset protection planning will help their clients mitigate income taxes through topics such as 401(k)/profit sharing plans, DB and 412(i) DB plans, carve out planning, equity harvesting, WealthBuilder Annuity, and many more topics. 5) How should clients own their stocks, bonds, mutual funds, etc.? Answer: NOT in their own names. If a modest amount of money, it should be owned by an LLC or FLP (multi-member) setup in the correct jurisdiction. If the amount is over $500,000, then an offshore asset protection trust should be considered. 6) Who is the number one creditor of most clients annually over the age of 65 and what do you do to help them protect against that creditor? Answer: Long-term care expenses are the largest annual expense of most clients over the age of 65. There are several ways to protect against that expense (traditional LTCI, VEBAs, asset based LTCI, life insurance with a free long term care insurance benefit). 7) Do you help your clients protect from downturns in the stock market and if so how? Answer: Yes. The closer a client is to retirement the more important it is that they not go backwards in the stock market. There are several ways to protect from downturns in the stock market while still giving clients good upside growth potential (equity indexed annuities, the Maximizer, principally protected mutual funds, etc.). 8 ) How do your clients own their boats, waverunners, snowmobiles, or planes, etc. Answer: NOT in their own names. Those assets should be owned by LLCs or FLPs (multi-member) setup in the correct jurisdiction. 9) Do you help your clients protect the equity in their homes? Answer: Yes, through some kind of debt shield (usually through equity harvesting and the 1% CFA mortgage). 10) Do you help your clients mitigate capital gains taxes and if so how? Answer: Yes thought the use of Private Annuity trusts, CGAs, CRTs, 1031 exchanges, etc. 11) Do you know how an offshore asset protection trust (OAPT) works and does a client’s money need to go offshore to have a properly setup OAPT? Answer: Yes and the client’s money does not need to go offshore when an OAPT is setup. The money typically sits in a domestic LLC. Only if there is a claim against the client is the money moved to the offshore jurisdiction. There are dozens of other questions we could have you ask your current or potential asset protection advisors but we think the above helps illustrate our point. What point? 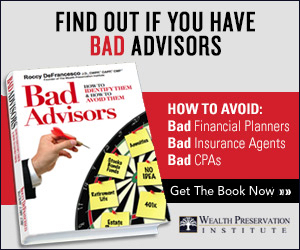 That most advisors, even advisors who think they know asset protection, really don’t. They might now a piece here or there, but in order to give comprehensive advice, you have to know more than NV, DE, AK, LLCs and domestic asset protection trusts. If you are not satisfied that your asset protection plan is in order or that your current team of advisors is able to help, please click here to find an APS™ rated planner who can help.